When you are just starting out, you can decide between cloud hosting and dedicated server hosting. The hosting industry is now coming out with various innovative solutions to allow online businesses to grow seamlessly. Both cloud hosting solutions and dedicated hosting plans can allow your business to grow without inhibitions. However, while in cloud hosting, you will not need to buy or rent a server exclusively for your own needs, in dedicated hosting, you have to lease out servers. The cloud vendor takes care of both the hardware and software needed by you. To understand which option may be more suited for your business, it is important to know the key differences between cloud servers and dedicated hosting servers. 1. Downtime Issues: To start with, cloud servers are always available because there are multiple nodes. So, even if a single server or component fails to function, the workload gets redirected to other active standby servers. So, there is absolutely no downtime because there is no single point of failure. You can get maximum site performance and the highest network uptime. However, when you choose to sign up for dedicated servers, downtimes are a reality once in a while. There may be hardware malfunctioning which causes the site to slow down temporarily till the glitch is resolved. Dedicated hosting does not offer multiple nodes which can share a server’s workload. 2. Resource Availability: When you have cloud servers, you can conveniently increase of decrease the RAM or CPU as per your requirements. Depending upon the workload, you are free to avail of additional resources in real time. However, in dedicated hosting, there are specifications and resource upgrading and downgrading may not be as fast. Resource allocation will happen but the process may take a while; allocation will not be instantaneous. 3. Security Advantages: Your cloud vendor will deploy robust and strict security measures for data protection. They offer data encryption, effective firewalls, virus detection mechanisms, and backups etc to safeguard critical data. In dedicated hosting however, you will have to undertake stringent security measures to ensure data stays secure. This means that you will need to make sure the server is upgraded regularly so that sensitive business data is not compromised. 4. Cost Savings: With cloud servers, you can cut down on operational costs because most vendors charge you according to a utility pricing structure. So, clients typically pay only for what they are using and nothing extra. The billing is usually on an hourly basis and it is affordable. Dedicated server hosting plans will usually charge their clients on a monthly basis. You are expected to pay a fixed fee no matter how many resources you actually use. So, much of the resources may also be wasted in the process. 5. Control: In terms of control as well, there is a major difference between a cloud server and a dedicated server. In cloud hosting, you will not be given total control of the servers; you will have to be satisfied with what is being offered to you by your vendor. In dedicated hosting, on the other hand, users have root access to servers. This means that you can run your own operating system, install custom software, include applications which will benefit your business etc. 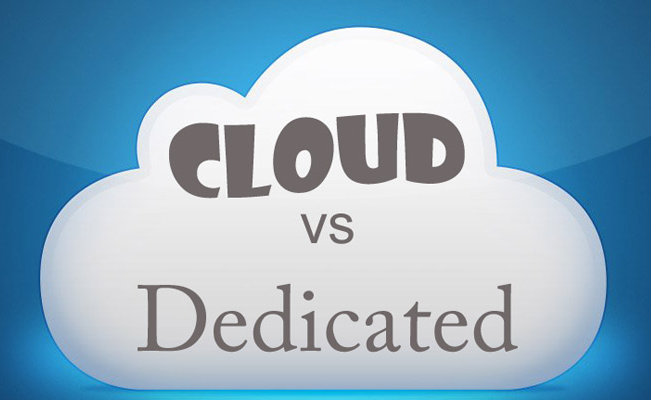 These are some of the key differences between cloud hosting and dedicated hosting. You need to select a hosting solution depending on your budget and needs. For ecommerce sites where traffic is unpredictable, cloud hosting is better suited. This is because you can get additional bandwidth or space whenever you need these in real time. Cloud servers are found to be very cost-effective for the smaller businesses which face fluctuating traffic demands. But, when you desire higher site performance, greater reliability, stability and resilience, and most importantly, complete server control, dedicated server hosting is better. When your concern is to optimize website performance without spending a lot of money which you must to buy and maintain a costly infrastructure, you should choose cloud servers. Businesses having variable workloads benefit from the cloud. For larger organizations that need high-end security or businesses with predictable demands, dedicated servers are more beneficial.